Rewarding experience for listeners with an appreciation for good songs and performances regardless of the style. 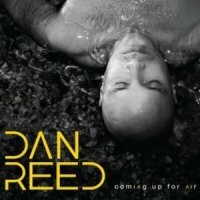 Aside from one or two tracks recorded for other projects Dan Reed has been pretty much in the musical wilderness for the best part of 10 years. 1999,s Adrenaline Sky album left me a little cold and I longed for a return to the Network days of the late 80s and early 90s. It's now almost 20 years since the last DRN album, 'The Heat', times have changed and so have people, meaning anyone expecting to hear songs similar to 'Get To You', 'Ritual' or 'Tiger In A Dress' are going to be sorely disappointed. Those a little more open minded, with an appreciation for good songs and performances regardless of the style, will find 'Coming Up To Air' a rewarding experience though I'm not sure how often I will be coming back to it for future plays. After such a lengthy absence it would be easy to forgive him for playing it safe and using the funk/rock blueprint he is associated with when writing a new set of songs but Mr Reed has decided to use his time away and life experiences as his creative base, thus maybe alienating many long time fans in the process. After attending his recent Liverpool show I was aware of several disgruntled people who weren't aware of his new musical direction but these narrow minded individuals, stuck in an 80’s timewarp, were certainly in a minority. After playing 'Coming Up For Air' just twice I was drawn, musically that is, towards a Bruce Hornsby comparison. There's no denying the songs are catchy and the lyrics are certainly a lot more introspective than we've been used to in the past. If I have any criticism at all, despite the CDs overriding appeal, it's with the album as a whole and its one-dimensional idiom. There is a spiritual undercurrent running through most of the songs and, though by no means overbearing, it's an obvious indication of how Dan has been affected and influenced by world events and situations he has come across during his travels. I guess his personal observations would be the natural choice for the basis of new material so whether you want to call it mature or simply reflective these issues are what make the album so 'different' when compared to his previous work. The semi-acoustic structure and similar pacing to the bulk of 'CUFA's songs give it a natural flow but once more lends itself to the criticism aimed at it a little earlier. The title track and 'Closer' are the closest we get to up-beat whilst 'Brave New World' and 'Promised Land' feature the most political and religious analogies respectively. I like the album a lot and have listened to it constantly since picking it up at the gig for the benefit of this review. If I'm feeling reflective it will be the perfect accompaniment to a glass of wine and several candles but it would be something of an injustice to regard it solely as a piece of entertainment. Dan Reed still has a lot to offer and is an underestimated talent but inviting us all to share his (almost) melancholic passages of introspection may prove both frustrating and distracting if the next album follows a similar dictum.